Teenage Mutant Ninja Turtles: Tournament Fighters is very much in the tradition of the Street Fighter and Mortal Kombat series, pitting you against opponents one at a time. Also included (besides the turtles) are three other familiar fighters: Shredder, Casey Jones and Hothead. The turtles did lose their trademark weapons and are restricted to unique melee attacks and kicks. Each character additionally has a set of special moves which can be performed with certain button combinations. Also each fighter can perform a fireball move, but has to collect a power up first which drops in the area from time to time. 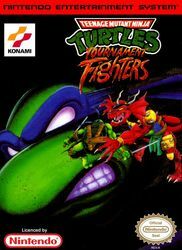 The game includes a story mode, where you can only select one of the turtles in a quest to face-off with the Shredder, a vs. mode (two fighters, the second either controlled by AI or a second player) and a tournament mode with four fighters.